Tiffen said the Steadicam Steadimate-S offers camera operators increased freedom, endurance and creative opportunity when working with single-handed motorized stabilizers like the DJI Ronin-S.
By pairing a single-handed stabilizer with a body-worn stabilizer, the DJI Ronin-S can be operated for hours with minimal physical fatigue while maintaining a wide range of vertical movement and adding full panning ability and “low-mode” operation. Users can minimize or completely eliminate the bouncing image effect that often occurs when using single-handled stabilizers as the Steadimate-S provides x-axis and y-axis stabilization while the Steadicam arm provides z-axis stabilization. The addition of the Steadimate-S transforms single-handed motorized gimbals into professional video stabilization systems. The unit comes standard with a post block and balance pin that fits arms with ½-inch posts. The weight capacity varies depending on the single-handed stabilizer, arm and vest being used. 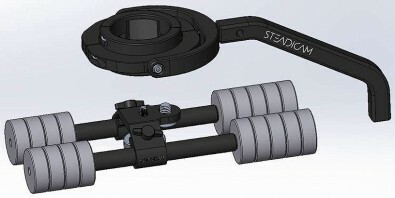 The Steadimate-S adapter can be purchased on its own for use with existing arms and vests, or as a complete kit available in two weight classes. The Steadimate-S 15 System comes with the A-15 Arm and Scout Vest and offers a 15 pound weight capacity, while the Steadimate-S 30 System comes with the A-30 Arm and Zephyr Vest and boasts a 30 pound capacity.